The word Dinosaurs did not exist until the mid 1800’s, before the 1800’s people knew Dinosaurs as Dragons, and evidence of this is littered all through human history. 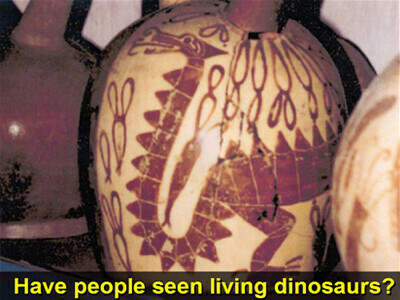 Before the word dinosaur was invented, people referred to these large reptiles as Dragons. 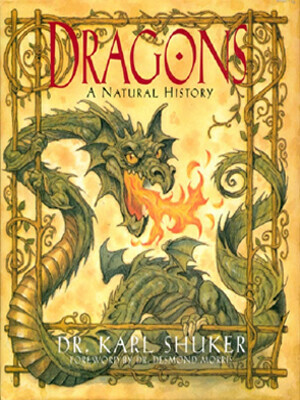 Not only in literature but all throughout the world, every known writing and culture referred to and depicted many species of Dinosaurs as we know them today, but always referred to them as Dragons. Ancient world cultures describe all these creatures as Dragons; it was not until much later that the word Dinosaur (which means ‘Terrible Lizard’) was even invented. 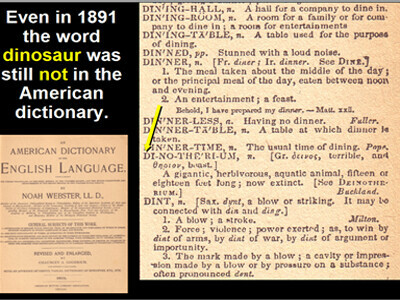 Looking in dictionaries from 1800’s you will see the word dinosaur didn’t even exist, until the late 1800’s. We can take ancient descriptions of dragons, even written down in ancient historical references, and match them up to fossils of dinosaurs we find today. The word “dinosaur” was invented by Sir Richard Owen in 1841. The Word Dinosaur didn’t even exist before the 1840’s; even in 1891 the word dinosaur was still not in the American dictionary. 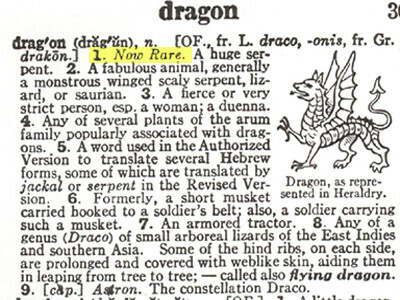 In the early 1900’s dictionaries, the definition at this time still didn’t imply them as mythical creatures. There are many passages in the Bible that refers to Dragons (Dinosaurs), referring to different kinds of Dinosaurs that lived throughout the ancient world. 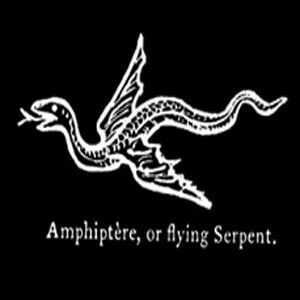 There are two additional passages in the bible that give a very detailed description about dragons, what they looked like, their terror and their description. 15 he eateth grass as an ox. 16 Lo now, his strength [is] in his loins, and his force [is] in the navel of his belly. his bones [are] like bars of iron. sword to approach [unto him]. can draw up Jordan into his mouth. [his] nose pierceth through snares. 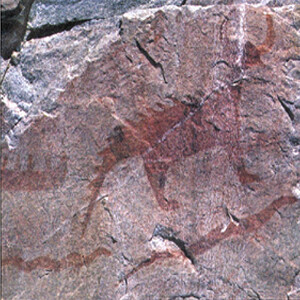 There are many indications throughout human history, art, literature and social traditions pointing to mankind’s encounters with ancient dragons (dinosaurs). The detailed descriptions of these dragons, in historic cultures, point to the exact replicas paleontologists have reconstructed from the remains of many different types of dinosaurs. The exact fossil reconstructions confirm that historic account accurately describe the anatomy of many dinosaur species. These legends are known all around in independent locations. Independent verification is a scientific method that compares unrelated or separate subjects that point to the same types of results to affirm a theory. 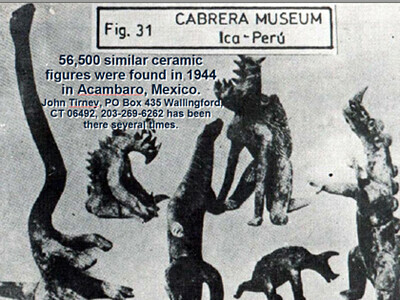 We confirm independent verification of dinosaurs throughout all of the worlds ancient cultures, which in ancient times, where known as dragons. 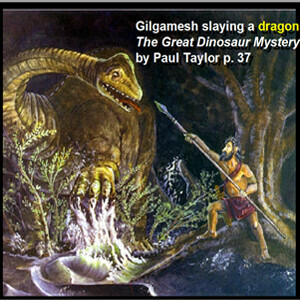 The story of Gilgamesh portrays him slaying a dragon. 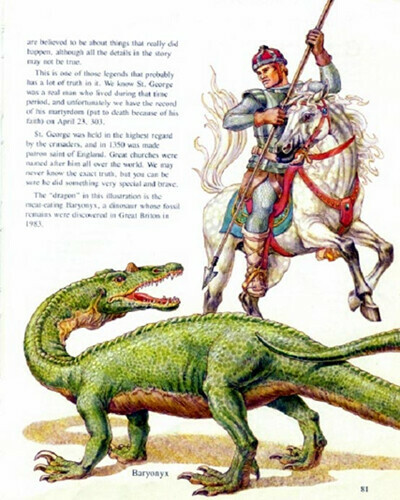 St. George slaying a dragon in 275 A.D.
St. George was martyred for his faith April 23, 303 AD. He is the patron saint of England and Portugal. 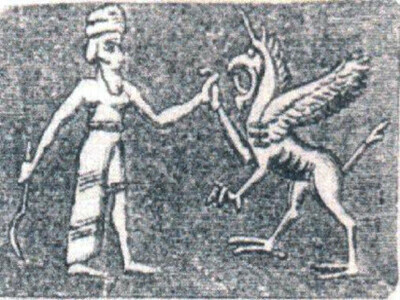 Historic records from all over the world not only tell of dragons and great serpent beasts; but we have many depictions of them from various tribes, detailing their features just as we find in paleontology. 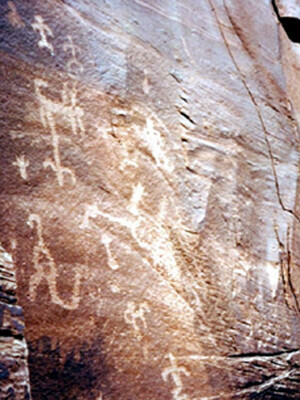 Indian pictograph, from the Grand Canyon. Found in the Havasupai canyon in Grand Canyon. His widow has the originals. The ribs there were a multitude of heaps, some great, some small, some middle-sized. 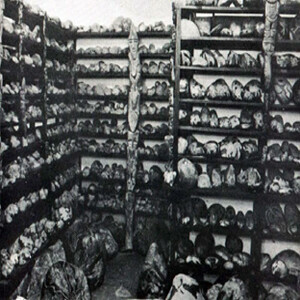 The place where the bones lie is at the entrance of a narrow gorge between steep mountains, which there open upon a spacious plain communicating with the great plain of Egypt. The story goes that with the spring the winged snakes come flying from Arabia towards Egypt, but are met in this gorge by the birds called ibises, who forbid their entrance and destroy them all. A.D. 793. This year came dreadful forewarning over the land of the Northumbrians, terrifying the people most woefully: these were immense sheets of light rushing through the air, and whirlwinds, and fiery dragons flying across the firmament. 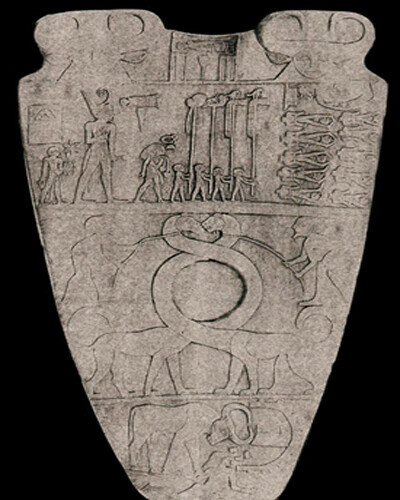 Slate palette from Heirakonpolis, showing triumph of King Nar-mer (first Pharaoh of a united Egypt) and long necked dragons. 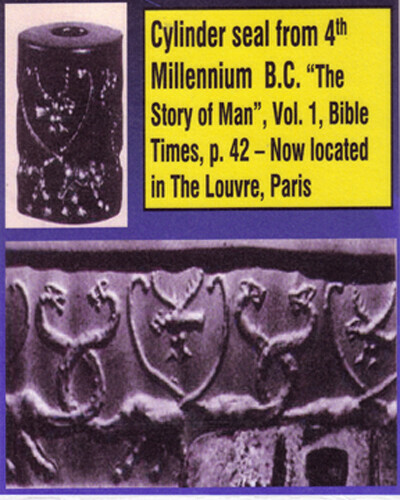 A Cylinder seal from the 4th millennium B.C. 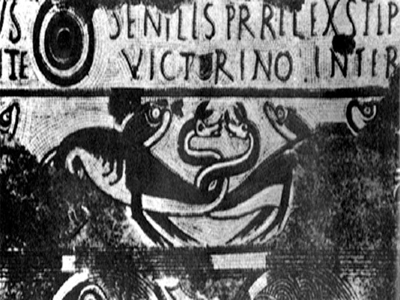 Roman mosaic showing two long-necked dragons, 2nd century A.D.
A Babylonian cylinder seal. approx. 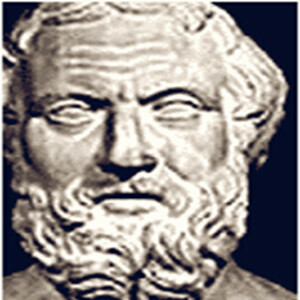 600 B.C. 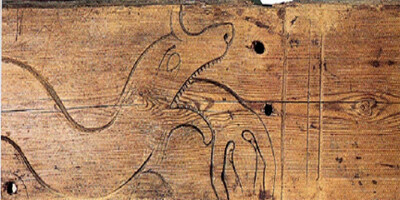 In 900 A.D. an Irish writer told of an animal with iron nails on its tail and a head similar to a horse. It also had thick legs and strong claws. On May 13, 1572 Italian Scientist Ulysses Aldrovandus obtained the dead body of a “dragon” that a farmer had recently killed and had it mounted for a museum display. Its description was just like a Tanystopheus. 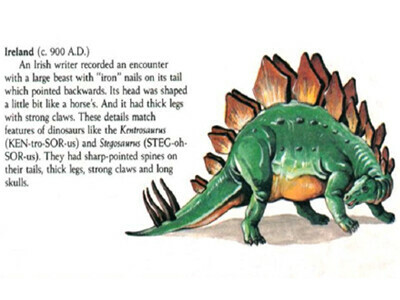 Books today teach that dinosaurs lived millions of years ago. Marco Polo lived in China for 17 yrs. 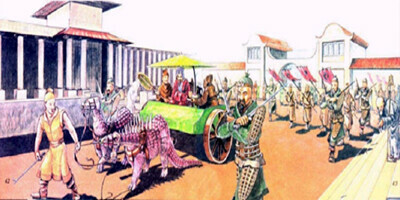 around 1271 A.D. and reported that the Emperor raised dragons to pull his chariots in parades. In 1611 the emperor appointed the post of a “Royal Dragon Feeder.” Books even tell of Chinese families raising dragons to use their blood for medicines and highly prizing their eggs. – DeVisser, Marinus Willem, The Dragon in China & Japan, 1969. – p. 5 Published by the Oakland Museum of Oakland California. The introduction by Samuel Hubbard is dated January 26th 1925. 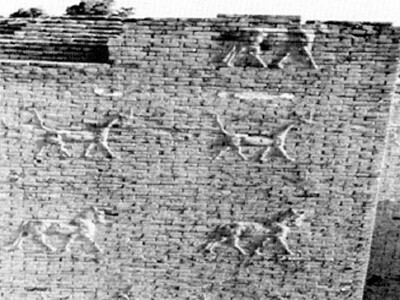 The Inca stone expressed many different lifestyles and great achievements that the Inca Indians had accomplished in their lifetime. Different great achievements of the individuals life would be inscribed on these stones such s brain surgery, heart surgery, etc. 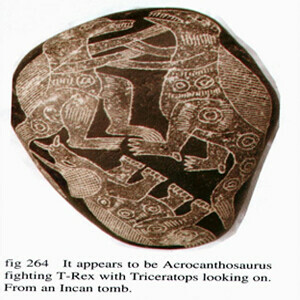 Many of these stones reveal pre-Inca Indian riding dinosaurs. 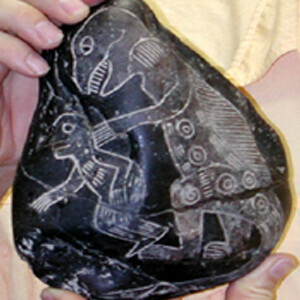 These Ica stone found in Peru are just a few of about 11,000 in Dr. Cabrera’s museum in Ica, Peru. 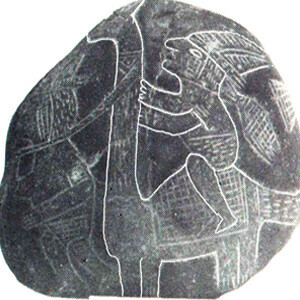 Over 50,000 “ ‘ICA’ stones” have been found in Peru since 1961. 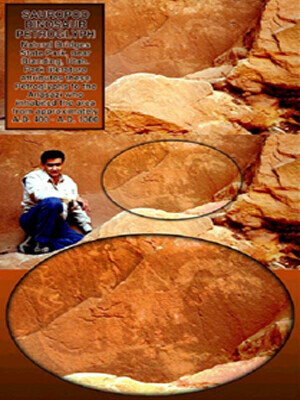 What is most interesting are the markings found on many of these stones reveal many biological facts about dinosaurs outer skin that could not have been know unless these people would have been able to physically see them. 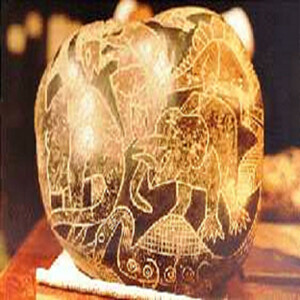 For example it was not known that the Triceratops had large circular bulges on its outer skin until a fossilized remain was discovered by Paleontologists, only to confirm what was already documented on the Ica stone.